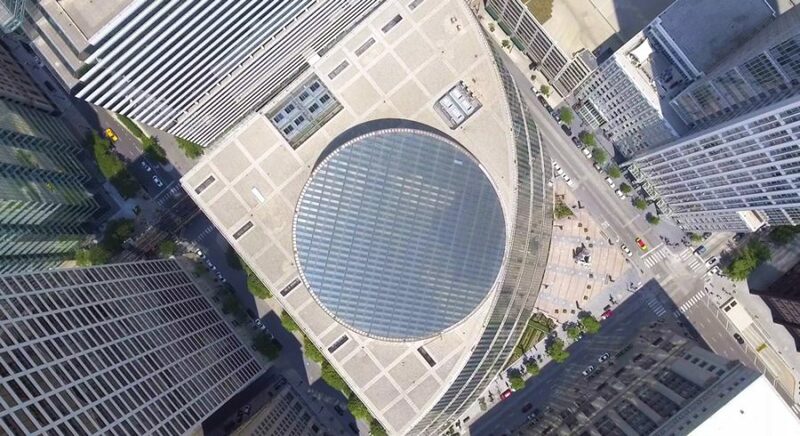 Nathan Eddy’s new film, “Starship Chicago,” fights for an endangered architectural icon, the James R. Thompson Center The film is hosted on the website of nonprofit MAS Context, a quarterly journal addressing urban issues. Though it has been years since Nathan Eddy (Medill ’06) was last on campus, he still waxes poetic about his favorite building — the oft-derided Main Library. Eddy — who spent much of his college career admiring the structures that dot the University’s landscape — said these buildings, whatever their quirks, have character. They were built from an idea, and these ideas are worth preserving, he said. His new film, “Starship Chicago,” fights for an endangered architectural icon, the James R. Thompson Center, located in downtown Chicago. The film premiered Oct. 7 in the Architecture Film Festival Rotterdam in the Netherlands. Eddy said the Thompson Center is an “outrageous” spectacle in a city of elegantly grave skyscrapers. He said it has been controversial since its opening in 1985 as the Illinois State government building. Today, the center sits in disrepair, with politicians like Gov. Bruce Rauner pushing to sell or demolish it. In the 16-minute film, Eddy argues for the Thompson Center’s preservation through interviews with architecture critics, former Illinois Gov. James Thompson, for whom the center is named, and Helmut Jahn, the designer. “Starship Chicago” has been shown in festivals all over the world, and has earned praise from numerous architecture publications. The film is now hosted on the website of nonprofit MAS Context, a quarterly journal addressing urban issues. Eddy said the center has numerous flaws, but these flaws are an indelible part of the building and the city’s history. To make “Starship Chicago,” Eddy said he called on several of his friends who graduated from Northwestern’s film department. He had previously enlisted them for his first project, “The Absent Column,” which unsuccessfully fought for the preservation of the Prentice Women’s Hospital building in downtown Chicago. Brian Cagle (Communication ’06), who worked on the first film, said he pointed Eddy to his new project. As soon as he told Eddy about the potential threat to the Thompson Center, Cagle said Eddy wanted to spark discussion and hopefully save the building. Felipe Lima (Communication ’06), who helped advise Eddy and his production team during the filmmaking process, said Eddy was passionate about the project from the beginning. “It took (Eddy) a minute before he was talking about other topics to explore … but this was certainly his baby from start to finish,” Lima said. Eddy, Cagle and Lima, along with several other members of the film’s production team, met in the Film and Projection Society at NU. Although he was not a film major, Eddy said he knew he had “extraordinarily talented” friends who could help him when he came up with the idea to make a short movie. Lima said the faculty and curriculum at NU encouraged students to reach beyond the skills immediately available to them in their majors. Eddy added that NU gave its students a forum to connect and grow both as friends and as people trying to understand their place in the world. “Those relationships with my closest friends and professors instilled in me the confidence … to go out and make these films that nobody else will make,” Eddy said.